Soya milk or milk made from Soya Beans is becoming more and more popular these days, because of many advantages over cow’s milk. A comparative chart of nutritional values of Soya Milk and Cow’s milk (Whole with 3.2% milkfats) makes an interesting reading. Some of the key components of both are given below for reader's ready reference. Cow’s milk also contains lactose, a sugar derived from galactose and glucose that is found in milk. Lactose makes up around 2–8% of milk. Many people are lactose intolerant and find it difficult to digest milk. I changed over completely to Soya milk about six months ago. Initially I bought readymade Soya milk from market. It is available from local sources in bottles or in Tetra pack packing. I did not like the locally made, bottled milk, because of the taste and also due to fact that I found getting plain milk rather difficult with flavoured milk more easily available. I found Soya milk available in Tetra packs quite agreeable and good for daily consumption. However, it turned out to be much more expensive than cow’s milk with a liter of Tetra pack Soya milk costing more than double that of Cow’s milk. I therefore investigated, whether we could make it home and after considerable research on net and help from my wife, we found the correct recipe. 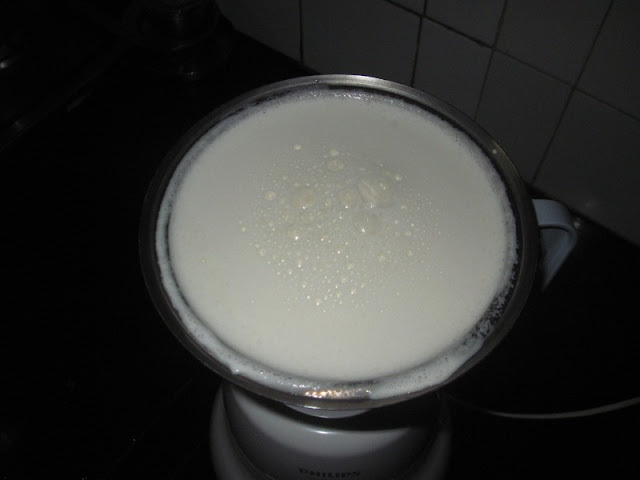 The milk, we make at home, is quite tasty and also much cheaper than Cow’s milk, which we used to buy earlier. I thought of sharing the recipe with the readers so that if someone is interested, he/she does not have to “reinvent the wheel”. Soya beans are available from any grocery shop, cleaned and ready for consumption. Here is the detailed recipe. 1. 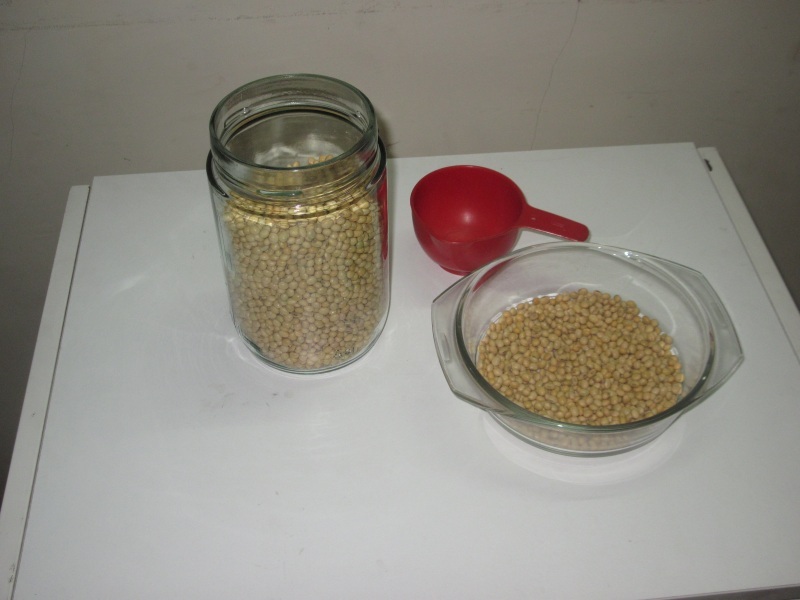 Take 1 cup of Soya beans in a bowl and pour water till the beans are covered. Add warm water till water level is about 2 inches higher than beans. Put a lid on the bowl and leave the beans overnight. 2. Next morning, add hot water and de-husk the beans by rubbing them between palms or by traditional way other lentils are de-husked. 3. Take 1.5 liter water in a jug. 4. 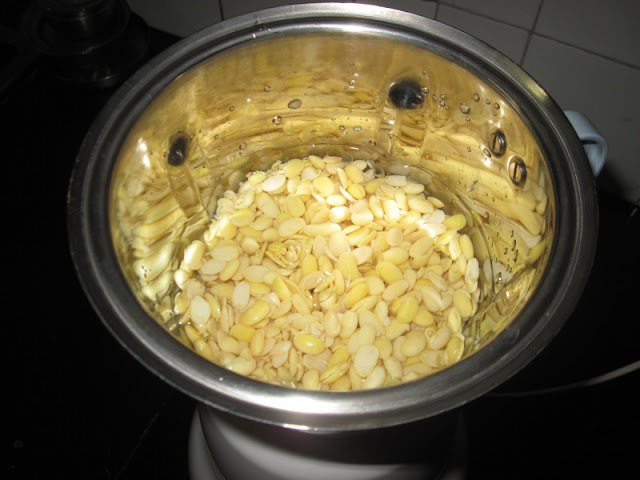 Add de-husked beans to a grinder-mixer and add water from the jug till beans are covered. Grind beans to a thick smooth paste. Add little water and grind till the paste becomes homogeneous. Repeat this procedure till mixture in the mixer bowl becomes a homogeneous liquid. 5. Allow the homogeneous mixture to settle for 4 to 5 minutes and then remove the foam or cream on the top, with a spoon and throw the foam away. 6. 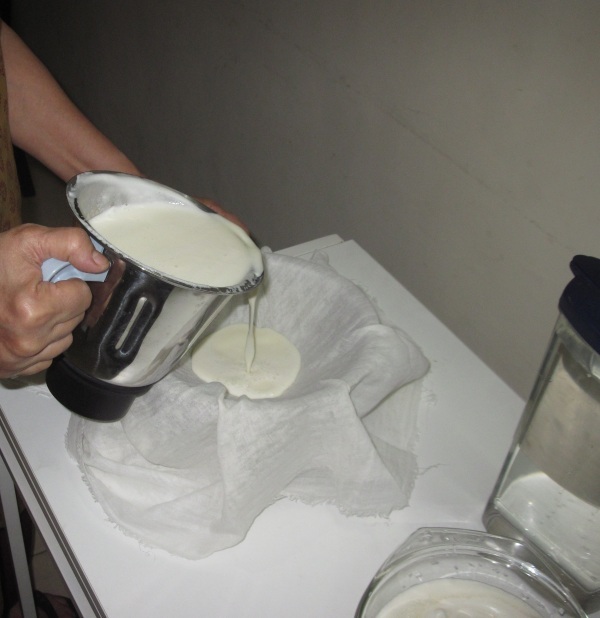 Filter the mixture through a multilayered muslin cloth, simultaneously adding some water left over in the jug. 7. When all of the homogeneous mixture has been filtered, a thick white precipitate would remain on the cloth. 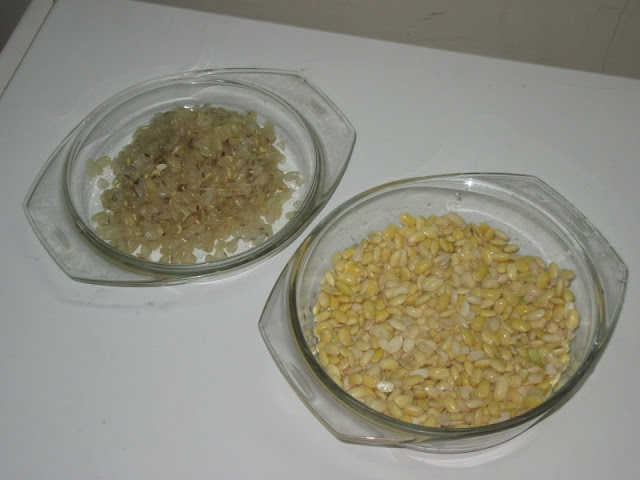 Collect the cloth around this precipitate with hands and squeeze it till all milk flows out and what is left on the cloth is a semi-dried ball of Soya flour. 8. 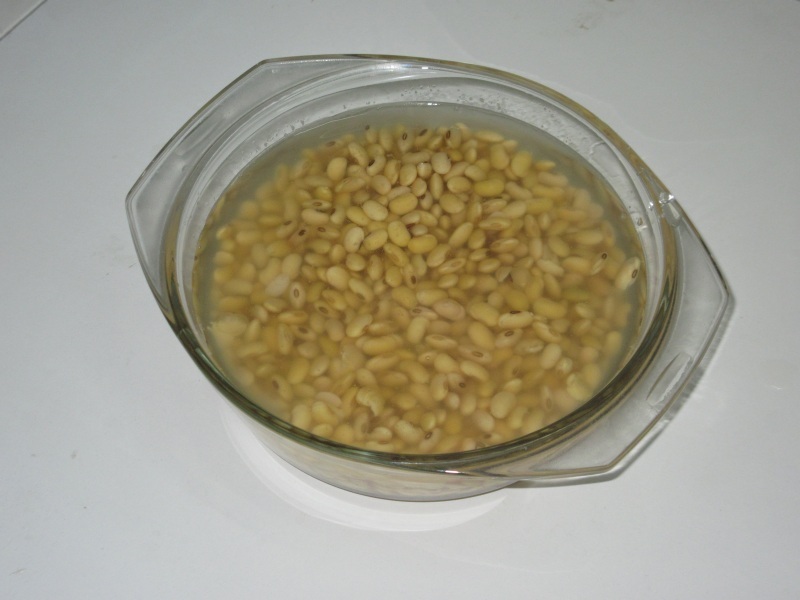 Add balance water, if left in jug, to the filtered Soya milk and mix thoroughly. Heat the milk on high flame to de-odourize it of Soya bean smell, stirring continuously. 9. Let the milk come to a good boil. 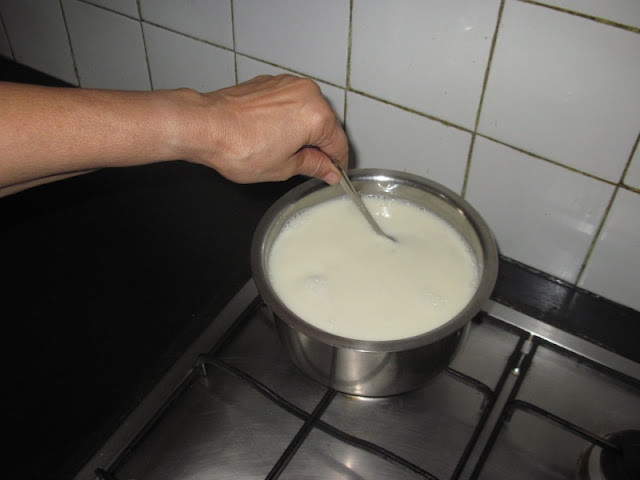 Take care to stir as Soya milk also spills over like cow’s milk, when on boil. Cut the flame and let the milk cool down slowly. 10. 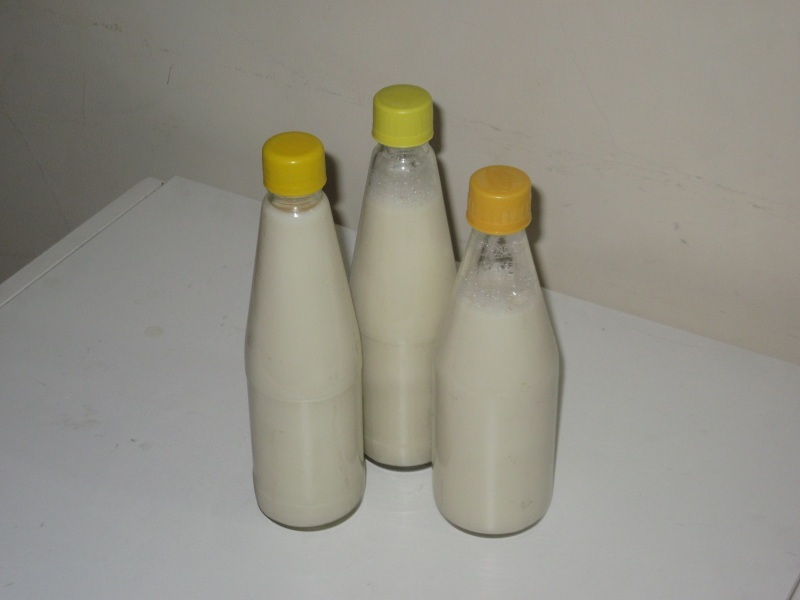 Pour the milk in glass bottles and store in a refrigerator. It helps to boil empty and washed bottles in water for about 10 minutes, once in a while, to avoid splitting of the milk during storage, though there is no need to boil bottles regularly. The milk now is ready for use. 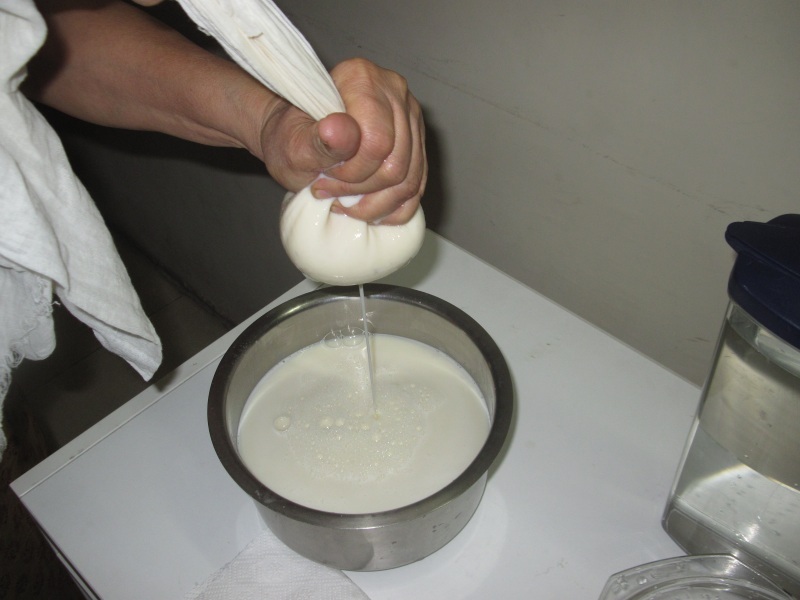 Soya milk can be used for any application, where we can use cow’s milk. The taste initially may feel different, if one is used to cow’s milk, but after some time, the milk is as good as drinking a glass of cow’s milk. The left over Soya flour can be mixed in vegetables. My wife makes “Koftas” or even sweets from it. The sky is the limit. Thank you. Excellent tip for vegans! Excellent and interesting. 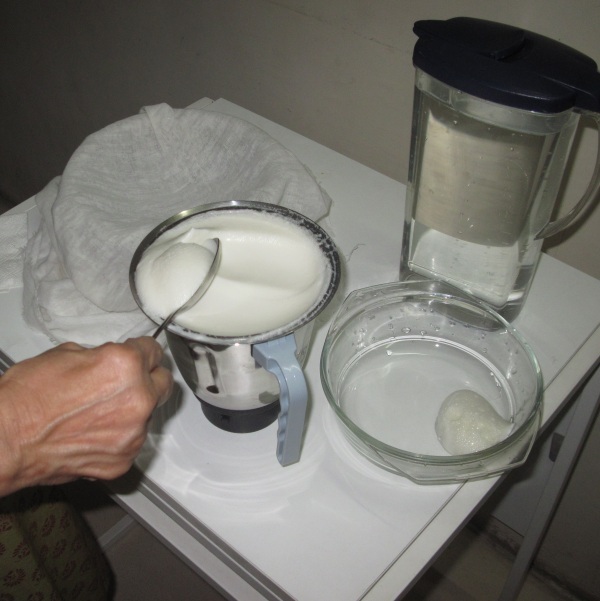 Thanks for sharing this detailed and inexpensive method of making Soya milk. Just one question...how long can this milk last in bottles in fridge or what is the advisable time limit for storage?